COCOA BEACH, Florida -- A 42-year-old German man was bitten by a shark just before 4 p.m. in the ocean off Cocoa Beach, Florida. The shark attack occurred just east of Shepard Park, an area heavily frequented by tourists. Brevard County Ocean Rescue Chief Jeff Scabarozi said that the man suffered a laceration to his lower right leg and was transported by Brevard County Fire Rescue to Cape Canaveral Hospital. Scabarozi estimated that the shark was three to four feet in length based on the size of bite diameter. 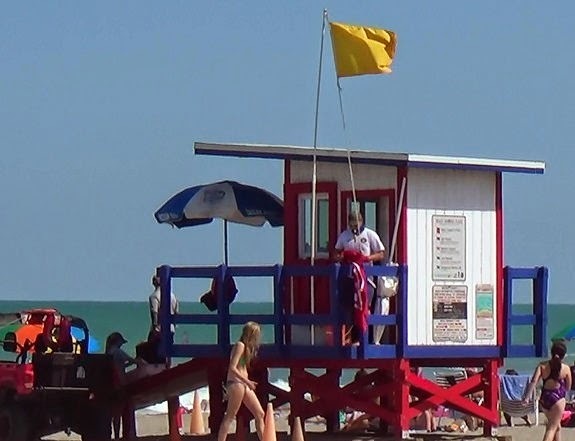 Brevard County lifeguards raised double red flags with a dangerous marine symbol that indicated dangerous marine life in the water after the shark bite. Many beachgoers could be seen leaving the beach after the attack even though the double red flags were later taken down and replaced by a yellow flag which means hazardous surf conditions.